Trinity Designs: Blogger's Challenge #88 - Alter It! Aren't these little cans stinkin' adorable? It was so hard to cover up their cuteness for this week's challenge, but boy, I sure did! My Mom gave me both sets of the empty tins last weekend when we went for a visit. She "challenged" me to make something out of them. Well, never one to resist a good challenge, I knew right away what I was going to do. In my Stampin' Studio, I have a Baker's Rack that holds my NEW Keurig one cup coffee pot. OMG, I love that thing! And so do my stamp campers - they have figured out all the cup sizes and have fun choosing their coffee, tea or cocoa. And I love the clean up - none! Anyway, I don't like how all the coffee bar sugars are just stuffed into a little ceramic pot on the baker's rack so I thought these little containers would be perfect to hold the individual packets of artificial sweetners. So, I got out my stash of Designer Series Paper and used some Washington Apple and Old Olive Patterns to cover the 3 tins. I chose the colors/patterns based on the original color of the tins were since I wasn't covering the whole things. The little labels are Whisper White cardstock that I ran through my printer and then I punched them out with the 1 1/4" Circle Punch. Each label has a Bashful Blue bloom from the Botanical Blooms stamp set stamped over the word for a little extra detail. The labels were attached to the back of some Hodgepodge Hardware Styled Silver frames with Mini Glue Dots. 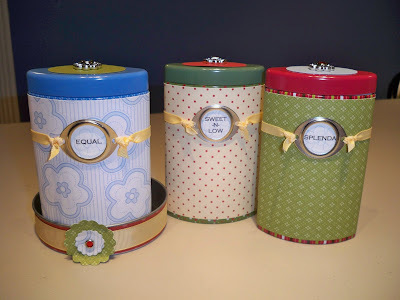 I tied them to the tins with Apricot Appeal Narrow Grosgrain Ribbon. 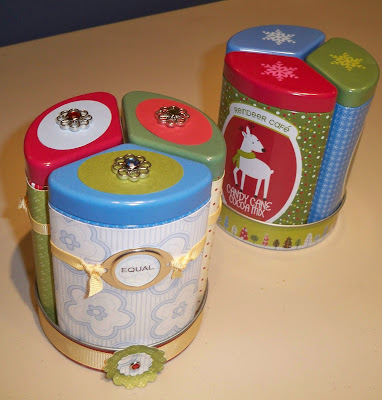 For the tops of the tins, I used my Wide Oval Punch and punched a coordinating piece of cardstock for each. They each got a Filigree Brad piece glued to the top with a Colored Rhinestone Brad in the center. For the tray that the tins sit inside, I covered it first with Riding Hood Red Patterns Designer Series Paper then went around it with some So Saffron ribbon from the FREE Sale-A-Bration Ribbon Bundle. A couple of flowers from my Big Shot Birds and Blooms die and another Rhinestone Fire Circle Brad covers the ribbon seam and it was finished! I love, love, love these little tins - they remind me of something from a 1950's styled kitchen and I can't wait to begin using them in the studio. My Mom is getting the second set for her kitchen! Love you Mom! Be sure to check out all the other Blogger's Challenge players today by clicking on the icon in my right sidebar. I'm sure they have some fun altered items to inspire you. Please leave a comment and tell me what you think of my canister make-over! I love to hear from you! What a great find! Cute idea! OMG, so cute and I love how they all fit in the same holder! Great way to alter those canisters! Fantastic idea, Robin! 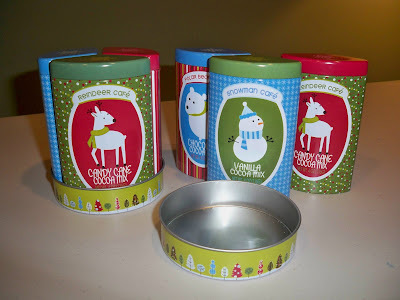 These little tins turned out wonderfully and it's so great that something practical can be so cute!!! What a great idea! Love the way those tins fit together! Very cool. Great job Robin! Too cute! Well these are fun! (I love tins and yes, I agree they were cute just as is) but you did a fabulous job making them look even better. Yes, Robin, your tins are too "stinkin'" cute! Very creative! Aren't these just adorable! Love what you did with them! Fabulous altering here! Stunning job. to die for..and you redefined the term " cute cans "...Your room must look very sharp with these. What a great idea! They were cute before, but waaayyyy cuter after! Great job! Great job with the tins. I love that your mom challenged you as well. Really cute! and oh so nice to know that you've got a Keurig...we got my father one for his birthday last year and he loves it, and loves getting all different kinds of coffee to try in it. These are adorable (and useful, too)! How adorable and what a great idea! Your stamp campers are going to LOVE seeing these. What a great find from your Mom!